Yes, and please stop spamming up my thread. This is for custom card discussion. Is there any way to delete post? Mods can do it... PM one of them and they should be able to take care of it. Only a mod can delete posts if people have already replied. Location: Follow the cold shiver running down your spine. While I wait for siege911 to clean this thread up, how about....another warlord! "Alisara decks travel in single file to hide their numbers." Last edited by Emperor_Eternal on Mon Jun 18, 2007 1:11 pm, edited 3 times in total. Location: I'm right behind you! HAHA! 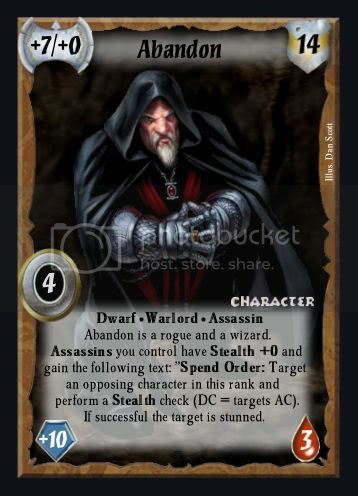 A cleric with Stealth? What?!?! I think her react is crazy. 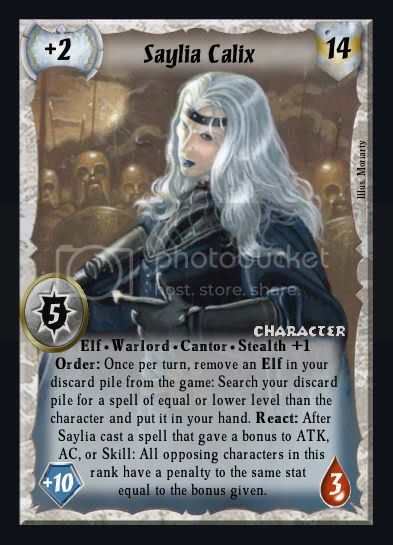 I'd remove the negative bonus to level part just because she could cast Lift Up Your Voices and kill a Warlord. Unless, you mean that the negative bonus only applies to a stat if a positive bonus is applied to a stat, but that'd be too complex to say with the limited room. She should probably be a Cleric/Rogue and lvl 4 so that the Stealth feat makes sense. Also, 11 Skill is big for a Cleric. I'd drop it to 10 or even 9. That is what it means and I think it says so. I wanted a twist for the fragile elves, and Stealth fits the bill. A multi-class rogue? Hmmmmm.....mabey. Yes, 11 is big for a cleric, but unless you all think it's too powerful, it stays. Updated Saylia Calix and Lord Kervaniss. New Dwarf on the way. Ok, here he is. I had so many ideas bouncing around for this guy I didn't know which way to go. I like him. His stats are pretty balanced. His React is not OPT, but the DC is high enough to justify that. 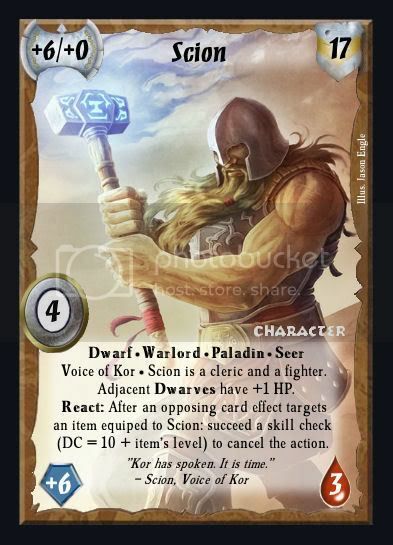 Paladin and Seer could be pretty cool with newer cards. Balanced, but kinda meh as well. Maybe it's just because he's posted after crazy stealth cleric of doom. Maybe make his react OPT but apply to an item on ANY character you control? "I am back! The hunt begins again!" (I have a big for the person who can guess the quote) Here's a new dwarf. Comments? I like him. Pretty well balanced and also has nice art. Well done. Why did abandon get the Wizard class? For several reasons. One is to further set him apart from Trespass. Another is that I thought his art looked like a rogue wizard.